Stars and other celestial objects radiate energy in many wavelengths other than visible light, which is only one small part of the electromagnetic spectrum. At the low end (with wavelengths longer than visible light) are low-energy infrared radiation and radio waves. At the high end of the spectrum (wavelengths shorter than visible light) are high-energy ultraviolet radiation, X rays, and gamma rays. X-ray astronomy is a relatively new scientific field focusing on celestial objects that emit X rays. Such objects include stars, galaxies, quasars, pulsars, and black holes. Earth's atmosphere filters out most X rays. This is fortunate for humans and other life on Earth since a large dose of X rays would be deadly. On the other hand, this fact makes it difficult for scientists to observe the X-ray sky. Radiation from the shortest-wavelength end of the X-ray range, called hard X rays, can be detected at high altitudes. The only way to view longer X rays, called soft X rays, is through special telescopes placed on artificial satellites orbiting outside Earth's atmosphere. In 1962, an X-ray telescope was launched into space by the National Aeronautics and Space Administration (NASA) aboard an Aerobee rocket. The rocket contained an X-ray telescope devised by physicist Ricardo Giacconi (1931– ) and his colleagues from a company called American Science and Engineering, Inc. (ASEI). During its six-minute flight, the telescope detected the first X rays from interstellar space, coming particularly from the constellation Scorpius. Later flights detected X rays from the Crab Nebula (where a pulsar was later discovered) and from the constellation Cygnus. X rays in this latter site are believed to be coming from a black hole. By the late 1960s, astronomers had become convinced that while some galaxies are sources of strong X rays, all galaxies (including our own Milky Way) emit weak X rays. Black holes: Remains of a massive star that has burned out its nuclear fuel and collapsed under tremendous gravitational force into a single point of infinite mass and gravity. In 1970, NASA launched Uhuru, the first satellite designed specifically for X-ray research. 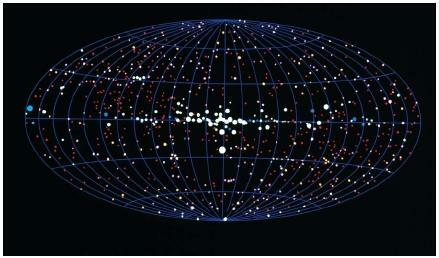 It produced an extensive map of the X-ray sky. In 1977, the first of three High Energy Astrophysical Observatories (HEAO) was launched. During its year and a half of operation, it provided constant monitoring of X-ray sources, such as individual stars, entire galaxies, and pulsars. The second HEAO, known as the Einstein Observatory, operated from November 1978 to April 1981. It contained a high resolution X-ray telescope that discovered that X rays are coming from nearly every star. In July 1999, NASA launched the Chandra X-ray Observatory (CXO), named after the Nobel Prize-winning, Indian-born American astrophysicist Subrahmanyan Chandrasekhar (1910–1995). About one billion times more powerful than the first X-ray telescope, the CXO has a resolving power equal to the ability to read the letters of a stop sign at a distance of 12 miles (19 kilometers). This will allow it to detect sources more than twenty times fainter than any previous X-ray telescope. The CXO orbits at an altitude 200 times higher than the Hubble Space Telescope. During each orbit around Earth, it travels one-third of the way to the Moon. CXO found the most distant X-ray cluster of galaxies astronomers have ever observed, located about 10 billion light-years away from Earth. Less than a month later, it detected an X-ray quasar 12 billion light-years away. These are both important discoveries that may help astronomers understand how the universe evolved.